It began with a second hand bargain, two large pieces on dark blue slightly napped material which distantly resembled wool but on a closer look turned out to be cotton. As my 14th century wardrobe could do with some extra garments it was soon destined to be a rush job medieval dress. Cotton is, of course totally inappropriate for the period, but I chose to use it nevertheless as the texture does not scream out "cotton". What's more, it easily washable, which is nice after a weekend in a muddy faire camp or kitchen. At first I dreamed of the dress Christine de Pisan is painted in, but then I realized that the hanging sleeves lined with white would not work for the practical dress I needed, and Christine's dress would require better quality materials as well. Still, I could keep the bright red under dress sleeves and just leave the dress sleeves elbow-length. I used my old kirtle pattern for the bodice. 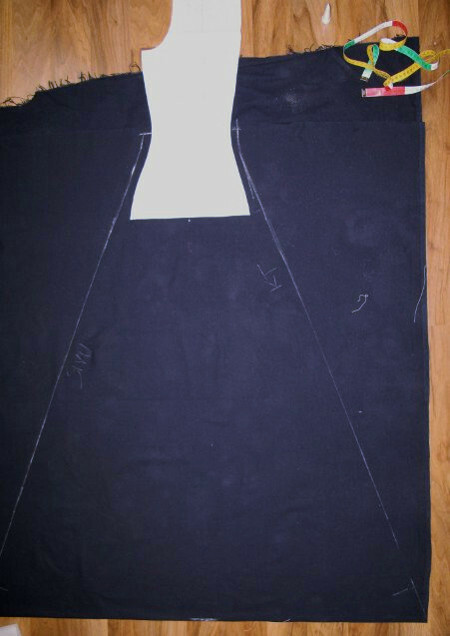 As I had plenty of material I decided to try cutting the skirt in four pieces joined to the bodice with a waist seam. 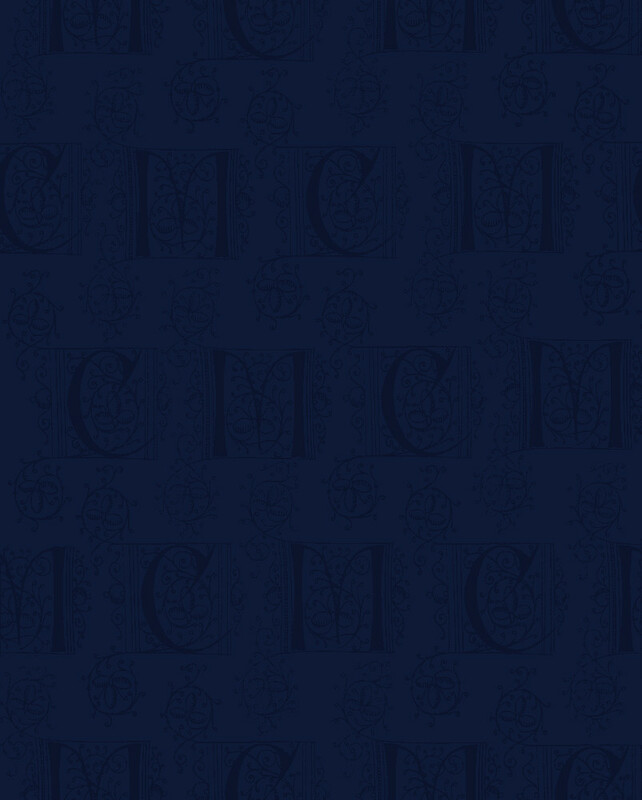 It's really a 15th century cutting method, but saves a lot of time in finishing the seams compared to gores. A few friends of mine had been taught about this method, I asked advice from them and reasoned the rest by myself. I flared the front seam less than side- and back seams. The waist seam shape is not quite right and creates some wrinkles at the back towards the sides, but decided to ignore that. I think I have heard somewhere that lacing stays secure best when you tie the lace on one eyelet at the waist. Now, when the waist seam created a bit of a challenge for positioning the eyelets I decided to put a pair of eyelets at the same level on both sides of the waist seam, placing the rest off-set as usual. When lacing I tie the lace on these aligning eyelets at the waist, and it does seem to work to avoid gaping at waist. The front edges are reinforced with the wowen edge of the fabric and the neckline with cotton tape. I had to work a bit more to get the sleevehead to fit this time. Perhaps the cotton was just not as soft and forgiving as wool. After reshaping the armhole a bit it settled in well enough, though. 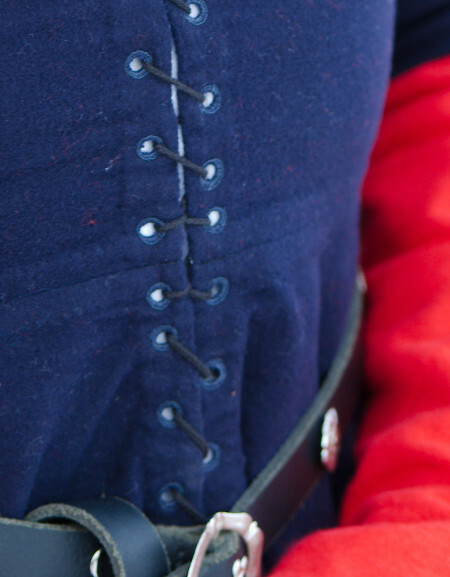 I still had some of the red cotton flannel left for Jarno's tabard, just enough for making false sleeves to give impression of a red kirtle underneath. I left them a bit shorter and looser fitting than in my light blue kirtle, as I wanted to avoid the awful work of a buttoning. I whip stitched the undersleeves on the inside of the dress sleeve end hemming. In theory they can be changed for a different look if I get inspired to make another pair. For the photoshoot I also made a silly woollen hood, also from stash material. The dress was originally planned to be a practical camp dress, but thanks to the strong colors it actually turned out quite fancy. It even matches Jarno's houppelande. I wear the cotton has of course revealed some inferior qualities compared to wool: It's hot in sun thanks to the dark color and doesn't really give much warmth after nightfall. But, then again, it washable and all the materials cost about 10€ total. So, what to call it? 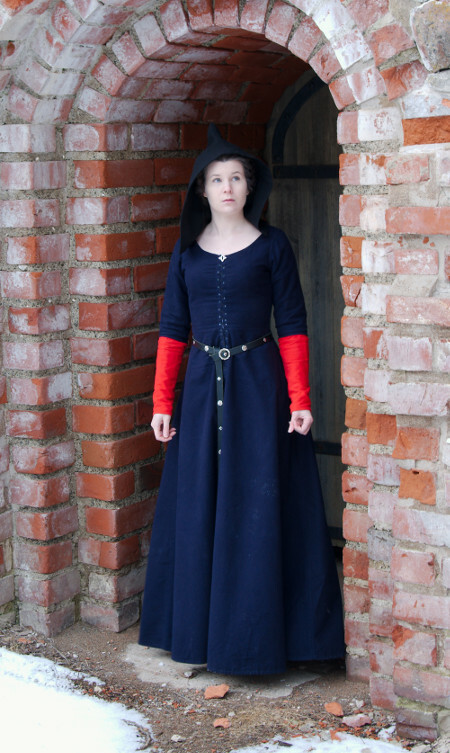 It's not a kirtle as there is supposed to be a kirtle underneath (see the sleeves). It's an overdress of some kind, then, and though it's closed by lacing not buttons I guess it could be called a cotehardie too. Instead of Christine de Pisan the finsihed dress looks rather like one figure on horseback in Duc de Berry's Très riches Houres, despite the madly impractical wide white skirt edge.